Physical harm, threats, violent language will never be used with any child. If any child is putting another child in danger, such as biting, hair pulling, hitting, kicking, etc.... they will be corrected by expressing gentle touch. The parent will be talked to about the child’s behavior. If the aggression persists, the parent and child will have a talk immediately on how we should handle the situation if the FLIP IT method mentioned below does not work. It is my job to keep every child safe, but also almost 85% of toddlers go through a phase where they may use teeth,or fingers to express their feelings. We will do our best to keep this from occurring, but we all know it can take just a second. Here at Home away from Home we use a system called FLIP IT! Flip it consists of four supportive steps to help young children identify their feelings, learn healthy self-control and reduce challenging behavior. FLIP IT helps to build skills that ALL children will need throughout their life. When using FLIP IT, and a child is upset and maybe throws a toy,acts out, throws a tantrum, refuses to share, doesn't want to play with others, this is just a few examples. FLIP IT uses empathy to find out why that child is upset. You empathize with the child, understanding why they feel the way they do. You let the child know that there is a solution to the way they are feeling, and tell them that together the child, and the provider will find that solution. This builds a trusting relationship with the child. If a child is upset, and you tell them "No do not do that , or you will be excused until you stop acting that way" you are not solving anything with the child's emotions, and why they are upset. There is always a positive solution to a negative feeling whether its rubbing their finger on their palm, squeezing play-dough, or a simple walk around the room. FLIP IT is a positive way to handle negative behaviors that are very common in toddlers, and caregivers, and parents are faced with these difficult behaviors daily. We need to remember children do not know how to process their feelings, that's where we come in to teach them how to understand, and control these feelings. They need to know its OK to be upset, but how they handle their feelings is the key. For more information on FLIP IT go to www.flipit.com. At HAFH we have a complete security system so doors are remained locked at all times. 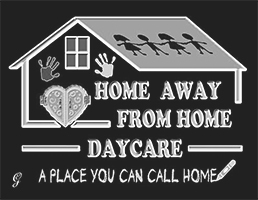 All the children parents will have a code to enter the child care facility at any time. This is just one more step in ensuring your child's safety. We also have cameras inside and out for extra protection!!! Best of all in case of a fire the Fire Department will be notified automatically!! REPORT ANY SUSPECTED ABUSED CHILDREN, CALL THE CHILD ABUSE HOTLINE AS A CHILD IS AFRAID TO SPEAK OUT!! WE NEED TO PROTECT THEM! !